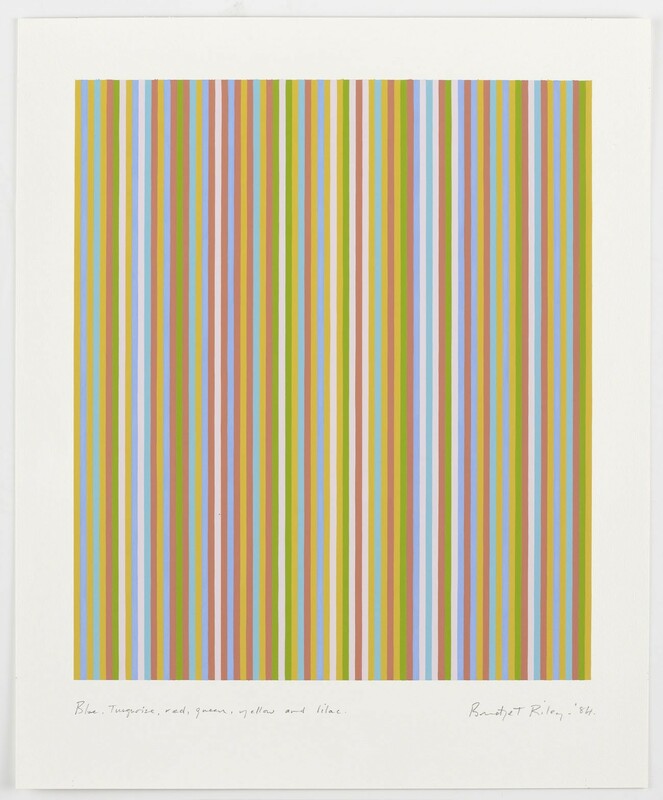 The stripe studies and paintings … ‘made between 1980 and 1985 reveal a progressive structural reorganisation and in that sense they are an important watershed in Riley's work. They form a passage from the perceptual - optically meditated - character of her art before 1980, to her work from the early 1980s onwards which addresses pure sensation directly : visual experience as a direct response to the source'. (Ed. Paul Moorhouse, Bridget Riley, Tate Britain, London, June - September 2003, p22). Blue, Turquoise, Red, Green, Yellow and Lilac, 1984 was one of a series of works conceived soon after Riley's travels in Egypt in the winter of 1979-80. During that trip Riley visited the Nile Valley and the museum at Cairo, studying at first hand, the ancient burial sites and temples of Egypt. Riley was enthralled by the consistency of palette used by the Egyptians to paint their gods, temples, to decorate their furniture, tone their motorized vehicles and adorn their jewellery and pottery. The brilliance of this palette of red, yellow, turquoise, green, black and white was further enhanced by the Mediterranean light and appealed deeply to the artist. On her return to London, Riley found that these colours continued to exercise a fascination. Any possibility of using them in her work was, however, tempered by the concern of appropriation. On recreating these colours, these 'hang-ups' diminished, although she felt it was important to work from memory, rather than copying the 'Egyptian palette' (Riley's term) from reproductions in books. While still limited in number, this range of 'Egyptian' colours needed a formal vehicle that was simpler than the curve (which Riley had been using for the last six years). 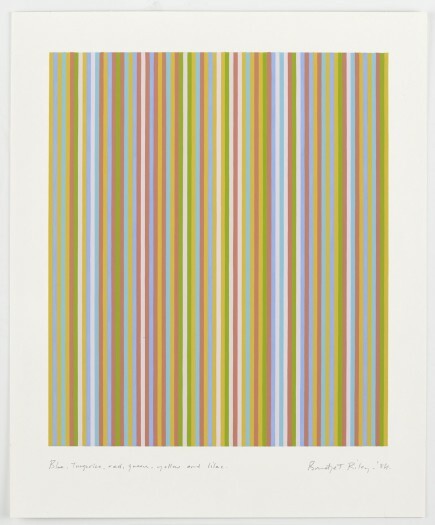 For this reason, Riley made the decision to revisit the coloured stripe, which she had used in her work since the mid-1970s. The stripe, a more neutral form, offered the longest edge and, hence, the possibility to align different colours 'side-by-side' to achieve Riley's quest for optical resonance. In Blue, Turquoise, Red, Green, Yellow and Lilac, 1984, each of Riley's 'Egyptian' colours retains its individual brilliance and tonal value, whilst simultaneously interacting with the colours immediately adjacent to it, in order to generate an increased level of light. Furthermore, colour interactions can now take place right across the sheet. The blue and turquoise stripe appear as double and triple the width of the other colours setting up relationships across the picture from left to right. Since the very beginning of her career, in her first black and white paintings, Riley sought to turn away from literal depiction, in order to create a new mode of painting, capable of stirring and containing visual sensation. The repetition of similar elements (e.g. lines, triangles, circles & curves) had the effect of overloading the viewer's eye with information creating an unsettling perceptual experience. In 1967, Riley introduced colour into her work for the first time. Colour was used until 1980 as a tool to demonstrate the perception of colour, and further, to convey an experience of light. As she described: `I don't paint light. I present a colour situation which releases light when you look at it' (ibid. p18). However, from around early 1980, we see a transition in Riley’s use of colour. Where before Riley selected colours entirely for their plastic, non-referential qualities, after this point we see her creating paintings which came from a direct, tangible, source of inspiration. The merits of this development are embodied in such works as Turquoise, Red, Yellow & Blue (Increased Width), 1982.